Your garden is a living breathing system that needs to take in fresh air and expel waste air and heat. The atmosphere inside of your grow room is just as important than the grow light you choose -- Consider this: If your grow light isn’t adequate for the size of your plant(s) canopy, but the atmosphere inside of your grow area is setup properly your plants will still grow. However, if you have a quality grow light but the atmosphere in your garden is toxic, you will not grow anything. In this section of our how to grow guide we’ll discuss heat, humidity and CO2 which make up the environment of your grow room. Your grow room design will fall into one of two categories, which need to be defined before going further into this subject - Closed Loop vs Open Loop ventilation. 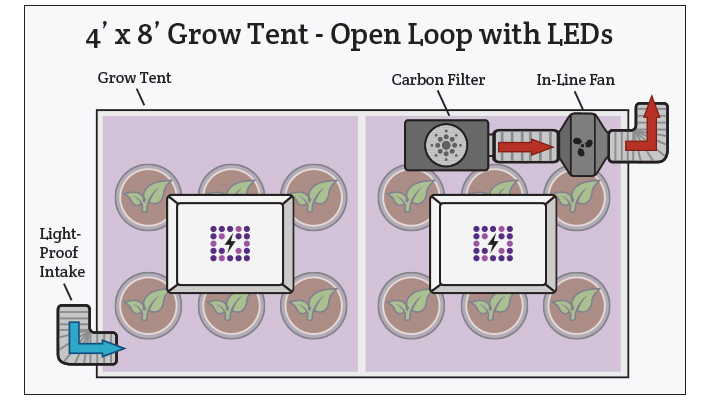 Open loop grow rooms consistently provide fresh air to the plants in one of two ways. Either an intake fan that pulls air from an outside source, or a passive exhaust system pulls in fresh air by forcing old air out through an exhaust duct. The outside source of fresh air could be a separate room in your house, the hallway, an attic, basement, cracked window or even directly from outside, if the air is filtered for bugs and large particles. 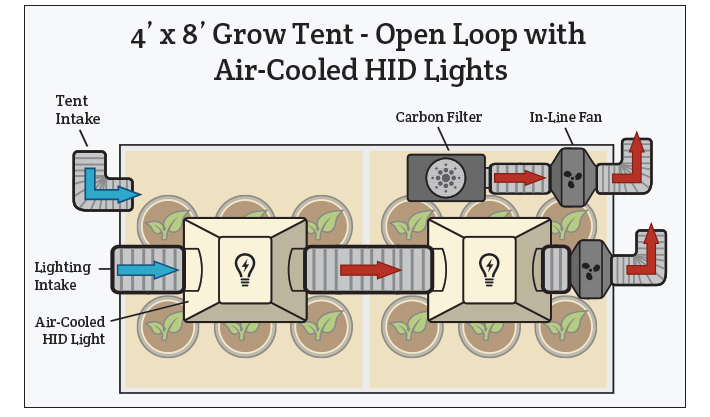 There are pros and cons of using each one of these sources for fresh air but the point is, open loop systems will have new, fresh air continuously pushed or pulled into the grow space. We prefer using the exhaust to push out old air. This creates a passive intake system which means that new air will be pulled into the room by virtue of old air being pushed out. The pressure inside and outside the room will maintain a balance, creating the pull of new, fresh air. Cracks in the door frame, a cracked window or an open port in the wall are all suitable ways of providing fresh air into your grow room. Ducting components refer to their throughput performance as ‘cubic feet per minute’ or CFM. 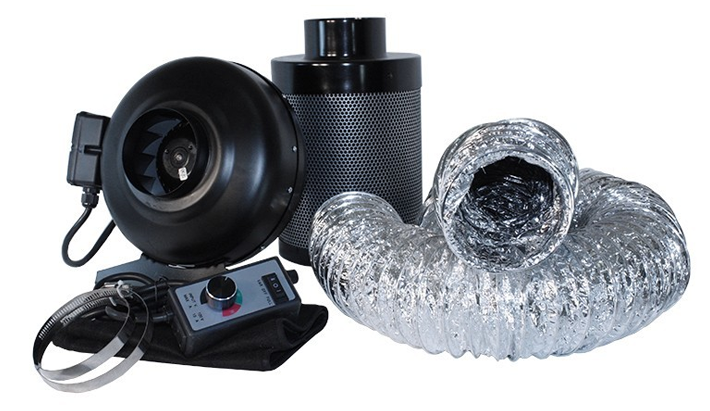 The rule of thumb for selecting the size and performance of your grow room exhaust fan and carbon filter is to calculate the Length x Width x Height of your grow room, and divide this number by five. The LxWxH gives us the total area of the room. We want to completely change out the air within the room every five minutes, so we divide by 5. The number you end up with is the minimum CFM rating you want your fan and carbon filter to be. (Oh yeah, you want a carbon filter to scrub the exhaust air of unwanted smells -- more on this in a few paragraphs). So, if we have a 10x8x8 room our total area is 640 sq/ft. If we divide this number by five we get 128. This means in order to replace the air in the grow room every five minutes we need a carbon filter and fan combo that is capable of handling at least this amount. Open loop systems should not be paired with Co2 generators. This is because the air within your grow room is constantly being replaced. The Co2 that’s injected or generated within the room will always be removed or diluted, and will prove useless. Typically, open loop systems do not require an air conditioner or dehumidifier. This is because the air within the grow space is constantly being replaced so heat and humidity do not have a chance to build up. Since open loop systems require less components, you will save money on your electricity bill each month. 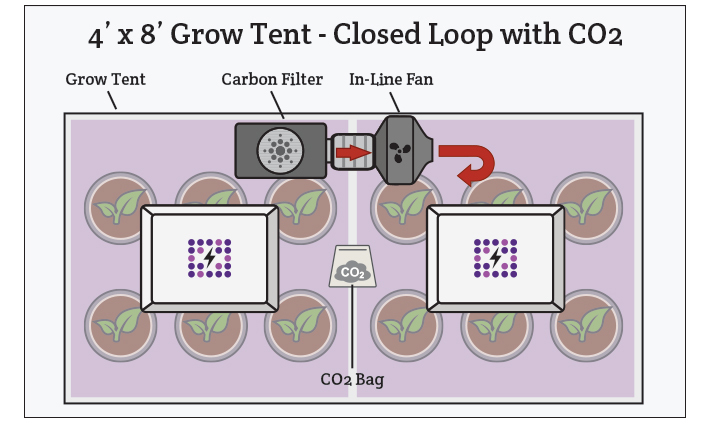 Closed loop systems use Co2 gas to provide the ‘fresh’ air within the grow room, and do not rely on ‘intake’ systems in the same way an ‘open loop’ grow room would. The exhaust within the grow room is controlled and is only used when temperatures rise to an unsuitable level, the humidity is too high, or the Co2 levels have risen to an unsafe level. 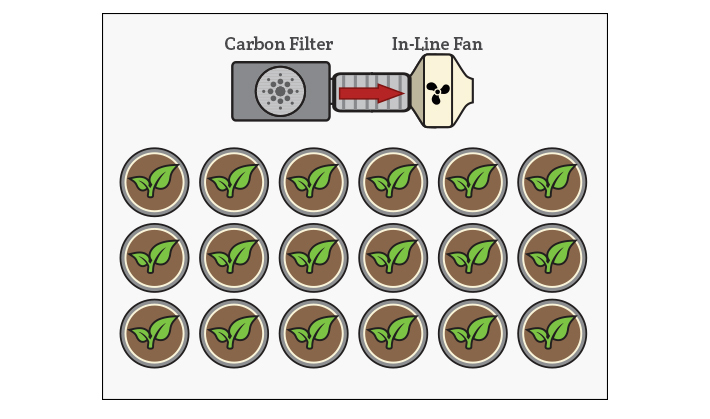 Some growers using a closed loop, Co2 enriched room will run their exhaust fan for 10 - 15 minutes every couple of hours to ensure their environment never gets stale. After the timed exhaust fan is activated, and has removed all of the heat, humidity, and excess Co2 -- a Co2 generator will produce the gas until its ppm level reaches the desired level for growth. Typically, growers will not add heat or humidity to a grow room because these elements are prevalent byproducts from the grow lights and plants themselves. Closed loop systems often require an air conditioner to offset the heat from your grow lights and dehumidify the moist air. Larger grow rooms will need a standalone dehumidifier to pull excess moisture from the grow room in addition to the air conditioning unit. What is CO2 and do I need it in my grow room? CO2 is already found in the air -- natural concentrations are about 400 ppm. Plants use CO2 during photosynthesis in order to produce energy. The key here is photosynthesis. Having an abundance of light to convert the CO2 into energy is what makes this process so effective. You need high powered lights in order for plants to take advantage of this extra CO2. Most fluorescent bulbs will not produce enough light to truly allow plants to use the extra CO2. Having a high wattage HPS/MH, LEC or LED light is required to take advantage of Co2 enrichment in your grow room. When growing crops indoors, you have created an artificial environment where you are responsible for providing for all the needs of the plants. 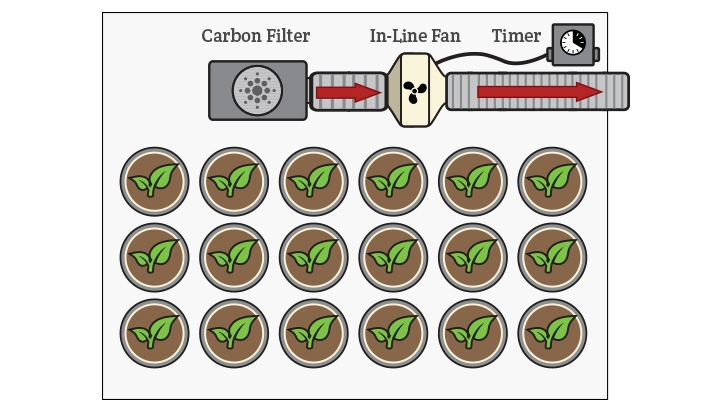 In addition to plant nutrients, you need to monitor temperature, humidity, and CO2. At Hydrobuilder, we carry controllers for automating all aspects of your grow room. These will make your life significantly easier, and are often times a necessity in the grow room. For a full guide on grow room automation, click here. Temperature is important to plants as it sets the stage for growth and proper development of the plant. Young plants tend to prefer higher temperatures. This is because it allows them to absorb more moisture in the air through the stomata in the leaves while the root system is still developing. You should slowly drop temperatures as your plant moves to veg, and then to flower and harvest. Proper temperatures can also reduce the risk of mold and mildew. Temperature will depend on the kind of crops and growth stages being grown. The perfect temperature starts with the location of your growing area. The size of the room, airflow, number and type of lights, and extraction rates of nutrients also affect temperature. Seedlings of most plants tend to prefer daytime temperatures between 68 degrees and 77 degrees Fahrenheit and 62 degrees to 72 degrees Fahrenheit when the lights are off. As plants get older, temperatures can increase, with the maximum temperature for most crops being 82 degrees F.
One important thing to note is that temperatures should not fluctuate too much between day and night cycles. A fluctuation of 5 degrees Fahrenheit is ideal and 10 degrees Fahrenheit is maximum. Temperature can be taken with simple analog or digital thermometers. Several thermometers should be placed various locations in the growing area and always measure temperature in the shade. Some thermometers have a memory, and can record the daily highs and lows. Crops can be sectioned off using plastic to create chambers of warmer and cooler temperatures as needed. If you need to cool down your grow room, try using LED lights and increase the ventilation in the room. You can also run your lights at night in the coolest part of the day. If you need to make the room warmer, add heating pads, additional lights, or switch to HID lights. 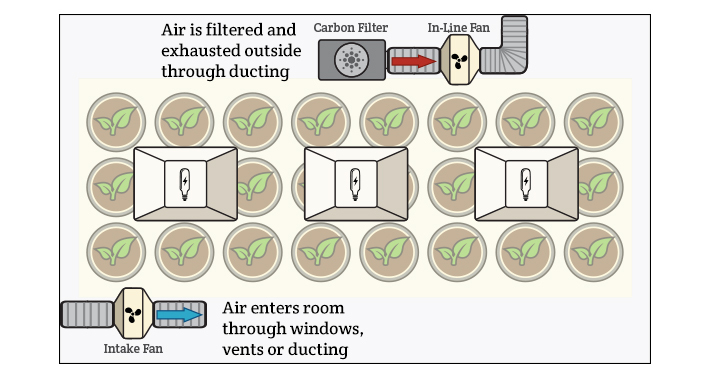 For more information, check out our full guide on dealing with grow room heat! Temperature and humidity work collaboratively to provide ideal growing conditions for crops. Relative Humidity (RH) is the measure of how much moisture is in the air at a given temperature, compared to how much moisture the air could potentially hold at that temperature. For example, a RH of 50% at 90 degrees means the air is only half “full” of moisture. Hotter temperatures can hold larger amounts of moisture. RH of 50% at 90 degrees will hold a considerably larger amount of moisture than RH of 50% at 70 degrees. Like temperature, each crop and growth stage will have an ideal humidity. 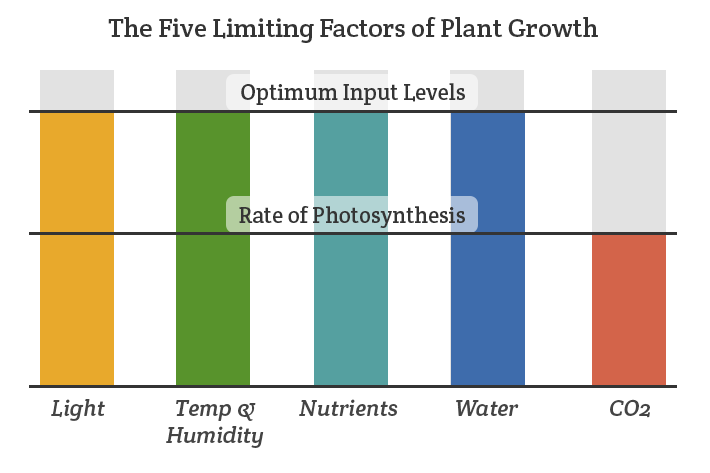 If humidity levels are too low, the plants may take up too much nutrient solution because they are not able to get moisture through the leaf stomata. This could result in nutrient burn from the increase of nutrient salts. Leaves will be wilted and look to have scorched edges. If humidity levels are too high, mold and mildew can prevail. Most plants require a higher humidity level during the growth period because the root system of younger plants is smaller and not as developed. Generally, the humidity can be decreased 5% each week until it 40% is reached. Always water your plants when the lights are on so they can evaporate most of it during the day. Once plants start blooming, try to gently shake any excess water from the plants to prevent mold. 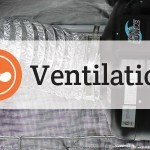 Ventilation can increase or decrease the humidity in the grow area and should be measured with a hygrometer. Some devices will measure both temperature and humidity. Like thermometers, there are models that will record the minimum and maximum and store data. If humidity needs to be increased, you could increase the temperature in your grow room with lighting and less ventilation or use a misting humidifier to add moisture to the air. Fans or hydroponics-grade dehumidifiers can lower humidity levels. 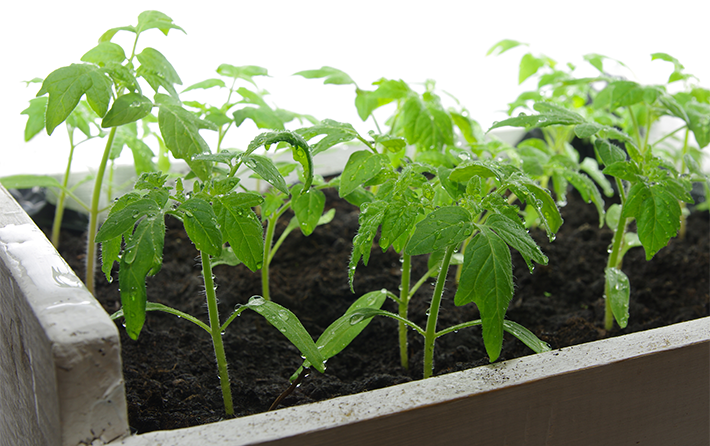 Grow rooms with poor ventilation typically lead to over-watered plants. When plants transpire (exhale) they release excess water and without proper ventilation, the excess water in the air has no place to go which can cause your plants to remain soggy and become susceptible to mold. Find more useful information on humidity here, and shop all our dehumidifiers here. Carbon dioxide (CO2) is the byproduct of animal and plant respiration. Is also critical to the growth and development of plants. In a greenhouse environment, ambient air CO2 is used up during photosynthesis. Without adding adequate (or optimal) CO2, your plants growth will be slowed or diminish completely. CO2 is most important during the growth stage and the first 6 weeks of flowering. If you are using lower powered grow lights such as CFLs or fluorescents, there is most likely plenty of CO2 available for your plants and it will not help to add more CO2 to the atmosphere than the plants can use. However, if you are using LED or MH/HPS grow lights, CO2 supplementation should increase your yields. In rooms with intense lights, adding CO2 to the atmosphere allows the plants to use more of that light and increase photosynthesis. Plants are able to produce more energy from the same amount of light and can grow faster and provide bigger yields. These plants also tend to be more resistant to heat and light stress. In fact, it is recommended to run CO2 in grow rooms with temperatures in the upper 80’s F to low 90’s F to allow for greater transpiration - which is like the plant taking a breathe. They breathe more when conditions are warm which will allow them to breathe in fresh CO2 to be used. 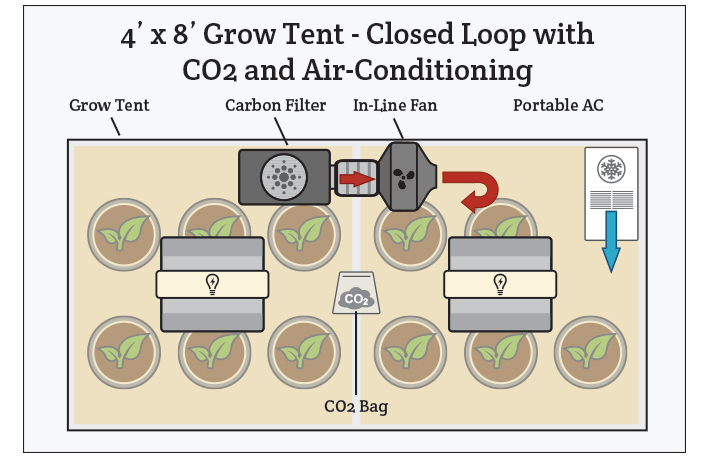 While adding small amounts of CO2 does not require a sealed grow area, higher concentrations in the 1200-1500 ppm range would be easier to achieve with a sealed, or “closed loop” room. CO2 is heavier than air, so oscillating fans will assist in distributing the CO2 evenly throughout the grow area. CO2 generators and compressors are the easiest ways to add CO2 to your grow area. A timer can be set up to turn on a CO2 tank or generator for a set amount of time. Turn off the CO2 at night as the plants are no longer using it when they are not photosynthesizing. As plants grow, testing CO2 monthly will help you adjust the system to the optimum levels. CO2 monitors will continually measure the CO2 in the area and open the regulator when levels drop below the preset amount. Monitors typically also come with photocells to make sure CO2 is never dispensed during the night cycle. Want to learn more? Check out our definitive guide to using CO2 in the grow room! Controlling odors in a grow room is simple. If you have built an environment with explicit exhaust and intake holes or ‘ports', you can expel odors efficiently. Using these ports to control where good air comes from and bad air goes is important. 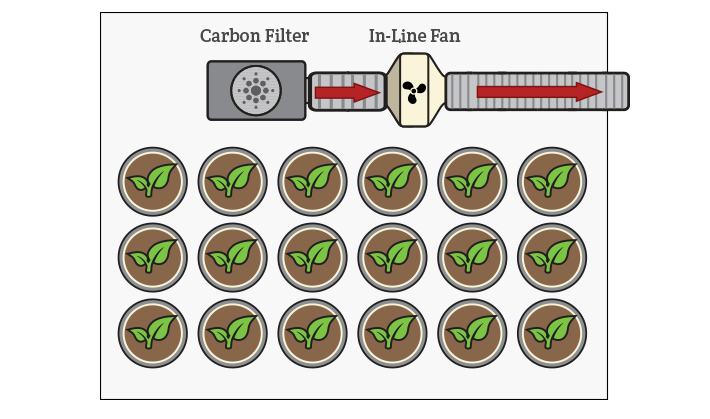 Typical grow rooms will have a carbon filter connected to an inline fan. This fan will pull air from the room through the activated carbon filter, which ‘scrubs’ the odors. It then pushes the air out of the room into an outside hallway, crawl space, attic, etc. Sometimes, venting hot, smelly air from your grow room is not possible. You’ll want to explore negative ion generators, ozonators, or fragrant gels that mask the smells coming from your grow. Carbon filters become ‘activated’ with oxygen which open up pores on the carbon located within the filter. The activated carbon will absorb odor particles and other molecules from the air passing through. Carbon filters have cubic foot per minute ratings (CFM) which tell you how many cubic feet of air can pass through the filter while still providing an adequate scrubbing. Running too much air through the filter can overload the carbon. This will result in smells lingering, rendering the filter ineffective. Too little air passing through the filter means you likely purchased a filter larger than necessary. The filter will still get the job done, and you can rest assured knowing your grow is discrete. Most carbon filters will last 1 - 2 years depending on the environment they’re located in. Rooms with humidity above 70% will lessen the lifespan of the carbon filter by as much as half. Some carbon filters can be refilled while others must be completely replaced. Carbon filters come in flange sizes ranging from 4” to 12” in diameter. They can be installed very easily to any grow tent or grow room. Ducting length can be up to 60" overall. Air in your grow area should be exchanged at least every 5 minutes. If you are using a grow tent that is 5' x 5' x 6' this is 150 sq/ft of air. For optimal airflow, you need a filter and fan that can move between 30 and 60 cubic feet per minute (CFM). It is also important to balance the flow in and out of air. You do not want to create a vacuum inside your grow space if you can help it so allowing fresh air to come into the grow room while older air is pushed out is important. We recommend pulling air through your filter and then pushing it out of your grow space or tent. Most filters are hung from the ceiling of the grow space to allow more area for plants underneath and to expel warmer air from the top of the grow space, however, heavier filters can be placed on the ground inside of a grow tent that cannot support their weight. Shop all our carbon exhaust filters here! Negative ion generators are not common in today’s grow room. These devices produce negatively charged ions which pair with the positive ‘odor’ and pollutant ions. By combining a negative ion and positive odor ion, the smell is neutralized. The particles will then fall to the ground as dust. Another not-so-common method of removing odors is to use an ozone generator. Ozone generators work by converting oxygen into ozone by exposing the smelly air to ultraviolet light. 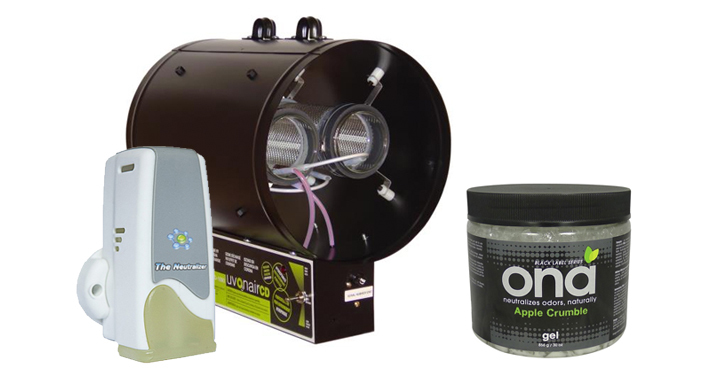 Ozone generators can be used both inside the grow room to maintain air quality or inline with the exhaust ducting. The nice thing about ozone generators is that they don’t need to be replaced periodically unlike carbon filters. Ozone generators can be hard on human lungs. For this reason, it’s best to avoid inhaling the air they expel, or spending excessive time in grow areas while they work. Lastly there are a few fragrant gels and sprays that can be purchased to combat unwanted odors in your grow room. These sprays and gels are used to mask the smell rather than remove or neutralize it. These methods typically only work for small closet grows. Growers using more than one light shouldn’t consider this an effective method to control odors.